For inclusion in Concrete Pier Pouring. 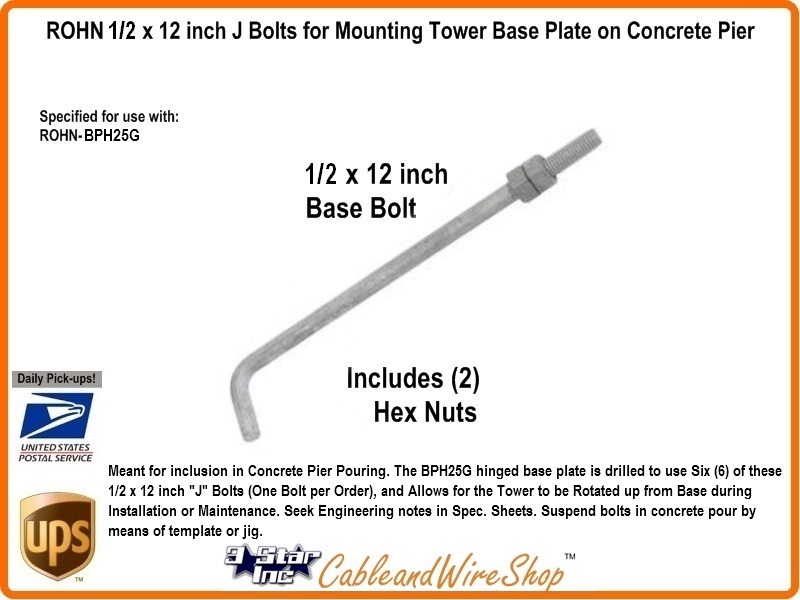 The BPH25G hinged base plate is drilled to use Six (6) of these 1/2 x 12 inch J Bolts (One Bolt per Order), and Allows for the Tower to be Rotated up from Base during Installation or Maintenance. Seek Engineering notes in Spec. Sheets. Suspend bolts in concrete pour by means of template or jig. Consult ROHN Catalog Links at Footer Section below for ROHN 25G Tower Details. Note: All 25G Tower Installations should be temporarily Guyed during Erection or Take-Down.